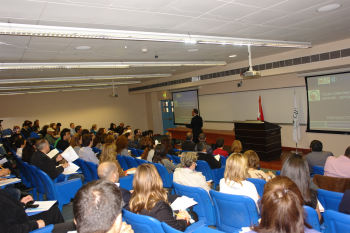 The Alumni Relations Office organized the third lecture for this fiscal year 2011-2012 as part of its “Keep Learning” lecture program: “Transactional Analysis” on Friday April 20, 2012 at the Business Building, Beirut Campus, Adelaide Vincenti Bahu room 903. Dr. Hady Safa who is currently running STANDARDS - Human Resources Consultants presented the lecture. Dr. Safa is, in practice, a public management trainer, a life coach and a motivational speaker. Over 200 alumni and friends attended the event, which was followed by a reception.